Consumers can help prevent check fraud as criminals become increasingly skilled and technically savvy using some of the latest technology in computer software, scanners and photocopiers. Criminals are capable of creating perfect blank check duplicates that they can use to defraud consumers and financial institutions. This article discusses some solutions that consumers can implement to help prevent check fraud by securing their checks whether they are blank or in transit for processing and processed. 1. Order new checks from your bank to make sure all the recommended check security features are available to help prevent counterfeiting and alteration. 2. Do not include too many personal information on your new checks. Follow bank recommendations. 3. Verify your new checks when you receive them to make sure the check count and information is correct. 4. Notify the bank immediately if you do not receive the checks within a reasonable timeframe and or if the imprinted information is incorrect. 5. Never leave your checkbook in your vehicle or unattended. 6. Secure your checks, deposit slips, bank statements and canceled checks in a locked location. 7. If your checks are stolen or lost, file a police report and/or contact the bank to notify. 8. Review your monthly statements diligently to detect unauthorized check transactions. 9. Notify the banks immediately if you become aware of check fraud. 10. Never give your bank account number to others especially when the request is not related to a transaction that you have initiated. Such cases may include unsolicited phone calls. 11. Shred canceled checks, account statements, deposit tickets, and ATM transaction receipts. Some of these papers may reveal financial information which can be used against you. 12. Don't leave blank spaces on the payee and amount lines. 13. When writing checks, use pens which can not be easily erased to replace the payee or the amount. 14. Don't make a check payable to cash. If lost or stolen, the check can be cashed by anyone. 15. Never endorse a check until you are ready to cash or deposit it. 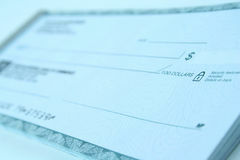 The check information can be altered and deposited by thieves if the endorsed check is lost or stolen. 16. Mail your bills and checks at the post office when you are ready to pay your bills. Leaving mails in the house mailbox with the upright flag is an invitation for thieves to steal your checks. Read about additional check fraud tips to prevent check fraud.